I've been trying to speak to Madeleine in French at home, and I have to admit it was going incredibly well until she turned two. Suddenly instead of being content with French action songs and basic vocabulary, she was soaking up information like a sponge and asking questions about everything in sight... and I didn't know the answers. M: No, but what tree is it? M: But what it's name? Me: Ummmmmm... c'est un "silvère - burche"
You can see where this is going. It may eventually have occurred to me to say "bouleau", but never in a million years would it have occurred to me to say "bouleau verruqueux" (yes, I looked it up, so I am a good mother after all), and not only because it sounds like a tree with warts. Perhaps Club Petit Pierrot will save us from a lifetime of Franglais. Madeleine got her first report card today, and apparently she understands very well and knows the words (I wonder who she learned them from!! ), but usually answers back in English. She is also "a lively child and finds it hard to stay focused"... hmmm...must be from my OH's side of the family. I know I was chuffed to pieced reading C's report card! Hello sneaky anonymous person! Yes, I grew up speaking both English & French & it's served me well... now I can speak a little of pretty much anything - spanish, italian, bahasa malay, hindi, thai... you name it! I just need to spend a few days somewhere new and words just start coming out of my mouth. I put it down to good genes (my Dad speaks about 6 or 7 languages) and to having prepped the language centres of my brain with French from birth and Spanish from age 10 or so. I'm really hoping to give my little ones the same head start in life. 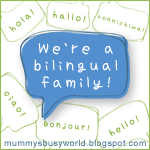 Did you know they also say people who speak more than one language have higher IQs? I think that includes sign language... anyone know if that's a myth? Ooh - just re-read that... I didn't mean, "Hey guys, I've got a high IQ, na na na na na!". I meant, apparently there is a link between being multilingual and having a high IQ. Is it because you have a high IQ that you are able to be multilingual, or does multilingualism help you score higher on IQ tests? Anyone know? Today is my birthday and it's 3!